That sounds really cool. This is the first time I’d ever heard about NSS and I missed it 😦 Oh well, always next year. Thanks for sharing! my pleasure! 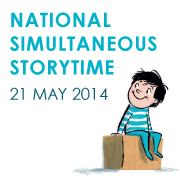 it’s such a great idea and my kids ejoyed the NSS, can’t wait to see what book they’ll choose for next year NSS. How delighted I am to know that May 15th (my birthday!) is NSS. I wonder if we have such a great initiative here in Italy! Will find out.